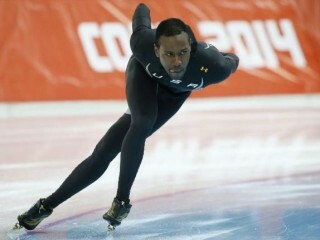 Shani Earl Davis is an Olympic Champion speed skater from the United States. Shani made history in 2006 in Turin, Italy, when he became the first black athlete from any nation to win a gold medal in an individual sport at the Olympic Winter Games, winning the speedskating 1000 meter event. He also won a silver medal in the 1500 meter event. At the 2010 Winter Olympics in Vancouver, Canada, he duplicated the feat, becoming the first man to successfully defend the 1000 meter gold medal, and repeating as 1500 meter silver medalist. He raced at the Sochi 2014 Olympics as favorite in the 1,000 meters. Shani started roller skating as a child, then turned to speed skating, but was unusual as he competed in both short-track and long-track competition. In 1999, he made the US speed skating team in both disciplines. Davis is also unusual as the first world-class speed skater of African-American heritage. In long track, Davis competed at the World Junior Championships in 2000-02, winning the 1,500 metre race in 2002. He attempted to make the US Winter Olympic team in 2002 in both disciplines, with his best chance figured to be in short-track. But he failed in that attempt, although there was some controversy in the final qualifying race, the 1,000. Davis won the race, which seemingly qualified him for the team but it was rumored that Apollo Anton Ohno, who was dominant among US short-trackers, and who was friendly with Davis, had thrown the race, allowing Davis to qualify for the Olympic team. Eventually Davis made the team but withdrew to compete in the World Junior Long-Track Championships. Between 2002 and 2006, Davis concentrated on long-track and became one of the best skaters in the world. But he continued to compete in short-track winning a gold medal at the 2005 World Championships in the relay. In 2004 Davis was second at the World Allround Championship to US skater Chad Hedrick, but Davis then won that title in 2005 and 2006, and set a samalog world record of 149.359 in January 2005. Going into the Torino Winter Olympics, Hedrick and Davis were considered possibles for gold medals at every distance from 1,000 to 10,000 metres, with Davis better at the shorter distances. Davis won his gold medal in the 1,000, and a silver in the 1,500, but there was controversy in the team pursuit when Davis withdrew to concentrate on his individual 1,000 metre race. Without him, the US team struggled and placed only sixth. View the full website biography of Shani Davis.